Hi, Jessica here! I’m excited to share my first Craft Storage Ideas post, Just One Tip for the New Year! Today I want to talk about organizing and storing embellishments, in particular, gems and pearls that are adhesive-backed. When I first started setting up my craft room last year I intended to use a Clip-It-Up to store all of my clear stamps. I purchased Avery Elle stamp storage pockets for my large sets and Simon Says Stamp 5×5 storage pockets for my smaller sets. I eventually realized that my stamp collection wasn’t going to comfortably fit on the Clip-It-Up (with room to grow) and I decided to switch to Jennifer McGuire’s method of storing my stamps in Fridge Binz containers. I ended up moving all of my stamps into the larger Avery Elle pockets as it was difficult to see the smaller pockets when flipping through my stamps. So I was left with a stack of the 5×5 pockets and I wanted to find a way to use them. At the time I was storing all of my gems and pearls in their original packaging in a drawer and I was constantly re-buying things I already owned but had lost in the drawer or just forgetting to use what I had. I needed to find a way to make them more visible and more organized. I started off by taking each set out of the original packaging and grouping them by color. Then I put each set of embellishments into a different storage pocket. Each storage pocket already had a piece of white cardstock cut to fit inside. The white cardstock really helps the color of the embellishment stand out. Sets with multiple colors were put into a separate stack. I cut 4.25×5.5 rectangles out of various colored 8.5×11 cardstocks and used them as dividers (I didn’t want to waste too much cardstock so cutting the dividers to a standard card size meant that the leftover cardstock was easily cut down for cards). I have all the basic colors, then a striped piece of cardstock for the sets with multiple colors and glitter cardstock for the gold and silver gems. I keep extra pockets in the back and I store the bin on a shelf above my workspace. This storage system allows me to easily flip through all my embellishments of one particular color so that I can find the exact shade, shape, and size that I’m looking for. I use the storage pockets because I had them on hand but there are many different ways you could customize this for your own use. I’ve included links below for the products I used. 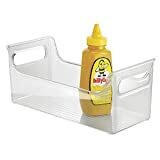 Unfortunately the exact bin I used is no longer available but the Fridge Binz Condiment Caddy should work nicely! You could store several sets in clear CD cases, grouped by color. I hope this gives you some ideas for organizing your own embellishments! Be sure to check out all our other tips this month! Welcome to Craft Storage Ideas, Jessica. I love this system. Mine is something similar as it is the tried and tested method where you can see all you’ve got by paging through the bins. Thanks for sharing with us! I already use this for my stamp storage. Why did I never think to use it for embellishments? Thanks for the tip! what a GREAT idea. I think I am going to use this same storage plan you have here for my embellishments because I am always doing the same thing. This is going to help me stop repurchasing items, which is my major goal this year. Thank you so much for sharing this. Janet, yes, one of my goals is to stop buying the same thing twice. I realized it was a problem when I placed an order with SSS and accidentally ordered duplicates of a couple copic markers, a stamp set, AND a stencil. I was so mad at myself that I spent the next two weeks obsessively organizing so it would never happen again! 🙂 Good luck with your organization! This is fabulous! Love being able to see everything when looking through the container. Welcome Jessica! Great first post. My 2015 goal is not to buy any supplies, 13 day in and I am doing good. However I have a huge stash of embellishments and I’m going to have to take a look at them to see if this type of system would work. I really like the organizing by color and somehow need to come up with an idea so I’m not digging thru everything to find the perfect embellishment. Thanks for sharing. Thanks Cicily! Yes, I was hoping to not buy any new supplies (at least for a few months) and then came the sneak peeks from CHA…. *sigh*….I want it ALL! 😉 Anyway, I hope this storage idea helps…I really like being able to see things by color! Usually if I’m deciding on an embellishment I’ll pull out the colors I’m considering and will also grab my sequins (which are also organized by color) so that I can see what goes together! Makes it much easier! I was able to do the same sort of organizing. Because I am short on table or counter space, I have a letter-size file box (from Staples or Office Depot) that fits legal-size Pendaflex files in it, side-to-side. I label my files by group – Alphabet, Borders, Birthday, Flowers, Hearts/Peace Signs, Sports, Rhinestones, etc.. . . and specific holidays. I was able to “score” some old, used Pendaflex files from a previous job; I have always seen these in floating around in office supply rooms, and nobody seems to want them. This system works great for me. The box is then portable, if need be, and can be placed on the floor or stacked with other boxes. Thanks for the tip! Thank Jessica — I REALLY need to organize my embellishments. It seems they’ve gotten lost in the shuffle when it comes to organizing. You’re so right about out of sight, out of mind! Just finished putting pockets (using A9 envelopes cut to size) on back of my 6×6 pads for scrap storage! Yay me. Thanks again! Previous Previous post: OrganizeMore WINNER and coupon reminder!